Wellington High School had their music evening last night. The range of talents was notable. Classical singing, playing, through jazz through to reggae, rock and blues. One of the bands, Head Chef, has just won the Wellington Battle of the Bands. Here are two peformances (make allowances for the poor visual and audio recording). All 15 year-olds. While today's political climate is tense, agreement on some essential economic truths could help lawmakers get things done in Washington, says Jeffrey Dorfman, University of Georgia economics professor. Government only reshuffles wealth, jobs and income; it cannot create anything on its own, as it has to take money from some in order to spend it on others. Any money collected or jobs "created" by government merely replace the private sector investment and job creation that would have occurred had people been allowed to spend their own funds. Income inequality does not harm the economy. While the poor spend nearly all of their money, higher-income earners save some of their income, which is just as good for the economy as spending, if not better. Saving leads to more investment and greater national income in the long run. Paying low wages is not corporate exploitation. Just as businesses have to set prices according to consumer demands, they establish wages based on the supply and demand for labor. Environmental over-regulation drives up prices. Because the poor spend a greater percentage of their income, especially on energy, such over-regulation acts as a regressive tax. Education is not a public good. While we publically fund K-12 education, it produces human capital that is privately owned by each person. While many defend public education because it is a "public good," it is important to realize that the ensuing benefits of education are not given away for free. CEO pay may be high, but so is the pay to athletes and movie stars. Such pay may reduce a company's profits, but it does not reduce the pay of other employees, as their pay is determined the marketplace. Consumer spending does not drive the economy. Saving more and spending less of our income will lead to greater wealth in the long run. "Free" things provided by the government are typically low-quality and unnecessarily expensive. Injustices happen. The government cannot correct every injustice, and every time the government steps in to "fix" something, it puts costs on someone else. Affirmative action policies, for example, grant college admissions only by denying admissions to other applicants. There is no such thing as a free lunch. "Free" government services cost money. Similarly, raising the minimum wage gives money to employees only by taking away jobs and raising prices for consumers. While liberals often focus their policy arguments on compassion, compassion cannot trump basic economic truths, writes Dorfman. All too often, government policies have unintended -- and harmful -- consequences. Source: Jeffrey Dorfman, "10 Essential Economic Truths Liberals Need to Learn," Forbes, June 5, 2014.
i te mea ki to tatou Use Policy Whakaaetia (AUP). pūkete me te kore he kaiparaurehe. Tatarahapa tatou no te poroaki, tenei kia meinga koe. Copyright © Admin tukutuku 2014 Rights Reserved katoa. It is our Acceptable Use Policy (AUP). We repent of farewell, this may cause you. Copyright © 2014 Web Admin All Rights Reserved. How many people claim a sole parent benefit unlawfully? I have now had chance to look at the report released today, Growing Up In NZ. Last report the children were 9 months; this report they are 2 years. Now, easily the most common form of benefit for people with dependent children is DPB (or now Sole Parent Support.) In 2013, 77 percent of benefit-dependent children relied on the DPB. 77 percent of those on a benefit at 9 months would equate to 818 of the study recipients claiming welfare. Yet only 439 claimed to be sole parents. Stunning. I can also tell you that the data gathered under the Household Labour Force survey is being checked against benefit data and showing some significant anomalies. More on that later. This mixes two sets of statistics with a qualification in tiny print. 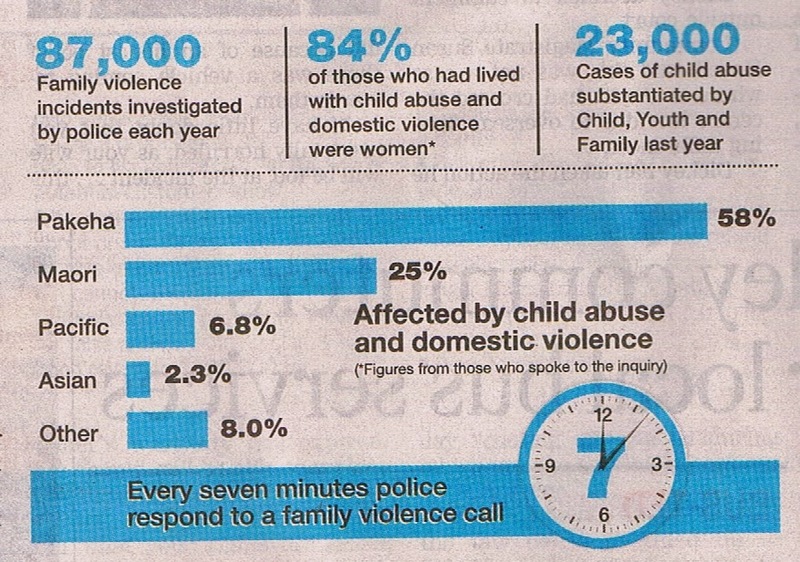 The left and right statistics are official data from Police and CYF. The one in the middle is from a self-selecting poll. Whether the ethnic proportions relate to the poll or official data isn't made clear. But it won't be long before someone conflates the two. Families Commissioner Belinda Milnes highlighted the study's findings on changes in the number of women without a partner, from 212 in the pregnancy phase, to 439 at the 9-month interview and 319 at 2 years. There is something very odd about those numbers. Of 7,000 children followed, at 9 months the percentage was 6.3%. Whereas there are consistently around 20 percent of babies dependent on welfare by the end of their birth year. Most on a sole parent benefit. Additionally, Counties Manakau has a higher proportion of benefit uptake than nationally. I know the study has a reasonably high drop-out rate but the numbers seem, as I said, very odd. One implication is that a lot of people who have partners are claiming a sole parent benefit. A lot. The report doesn't appear at the Growing Up In NZ website yet. Find below what I wrote about the Glenn Inquiry just over one year ago. A large majority of submitters were female. The resounding impression is that the overwhelming problem lies with men. Oh and the colonist-blaming conveniently pops up. Māori were once a people who held in high esteem their tamariki (children) and wāhine (women) because of the treasured roles they had in their whānau, hapū (sub-tribe) and iwi (tribe). Nevertheless, colonisation brought with it new ways, including privileging the place of men, which rendered women and children as their possessions (Section 4, p127). It is grim reading and I don't intend to denigrate the submitters. It's the tenor of the report itself. A new book called Child Poverty by Simon Chapple and Jonathon Boston will be published next week so the pre-release media activity has begun. Children’s Commissioner Russell Wills advocates restoring benefits in real terms to where they were a generation ago. As most of the child poverty problem is generated by single parent children, let's check that. A 'generation' back would be 1989 - before the 1990s benefit cuts. ('Any of the above benefits' refers to unemployment, sickness etc but it is important to note the rates include Family Support). Family support. The maximum amount payable is $36 a week for the first child and $16 a week for each subsequent child. Family support is provided to people with dependent children who meet income eligibility requirements. It is paid to income-earners through taxation (see section 25.2, Taxation), but is delivered to beneficiaries and non-earners through the social welfare system. Family benefit. This is a universal benefit paid at the rate of $6 per week to the carer of every dependent child in recognition of the contribution of families to the care of children. Its value has been $6 a week since 1979, and the direction of policy in recent years has been towards supplementing family benefit with additional assistance to low- and middle- income families. Let's use the sole parent with two children example. Accommodation benefit. Accommodation benefit is for people whose income and cash assets are limited and who have high accommodation costs. The maximum rates of assistance at April 1989 were $40 per week for a single person, and $65 per week for a married couple. A supplement of up to $20 per week may be paid for elderly people and people with disabilities who are in residential care. How much is a sole parent with two children getting today? For simplicity's sake I'll table a breakdown for a single parent with two children aged under 13. Figures are all in 2014 $. The 1989 total is about half way between the highest and lowest 2014 totals (left click on image to enlarge). Family structures are being broken under economic pressures and the facilities are not there to stop children from falling into a cycle of violence and poverty. Family structures are not even formed in many cases, let alone broken. If a society is prepared to reward the worst impulses and absence of positive values in people, it can hardly be surprised at the result. I was asked to speak on Leighton Smith's show last Thursday about youth crime in general (sparked of course by the latest West Auckland incident) and what I thought was contributing and if we could turn the ship around. I talked about how violent incidents tend to stay within dysfunctional families. In this instance it has spilled over. But the dysfunction has been there for decades. The dysfunction that comes from making children a source of income and allowing them to be held hostage to their parents lifestyles. I talked about the fact that young men in prison are much more likely to be fathers. Criminals have more children. But there is no point in treating the whole population to cure a problem that rests in a small minority. We do not need to monitor every child and we certainly don't need to pour more money into every home with young children.